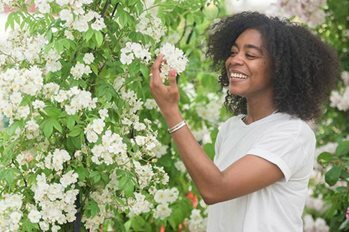 Among the line-up of stunning gardens at the RHS Hampton Court Flower Show were the Lifestyle Gardens - a new category for 2018 - with ideas from up-and-coming designers that featured plenty of take-home ideas. New for 2018, the RHS is celebrating internationally-renowned individuals in horticulture, with our first Horticultural Hero being Piet Oudolf. The influential Dutch garden designer is also a leading figure of the New Perennial type of planting that uses bold drifts of herbaceous perennials and grasses for colourful, year-round interest. In his display at RHS Hampton Court Palace Flower Show, visitors walked through the drifts of flowers and grasses, with different plant combinations revealing themselves, such as the contrasting flower forms of the peach Achillea with spires of mauve Lythrum, or tall pink Echinacea underplanted with shorter stems of silvery blue sea holly. The many kinds of grass softened the planting and added movement as they swayed in the breeze. The plants used in this brand-new feature are being recycled and relocated to RHS Garden Wisley after the show. In another first for the RHS, visitors enjoyed walking through a spectacular display of thousands of Verbena bonariensis. Sweeping alongside the Long Water, the river of these airy plants created a dazzling display of lilac, lavender and violet. Senses were ambushed by the colour and scent of fine displays of massed roses. Highlights included Rosa ‘Starlight Symphony’, a compact climber with white semi-double blooms, awarded Rose of the Year, and a magnificent metalwork gazebo shown by Fryers Roses, demonstrating the art of rose oil distillation for perfumery. The RHS Grow Your Own area was a source of inspiration for creating some amazing dishes to impress friends and family, with the help of Raymond Blanc. This feature was a feast for the eyes (as well as the belly), packed with raised beds and borders that were bursting with colourful fruit and veg. Evolve: Through the Roots of Time took visitors on a tour of discovery through 450 million years of plant evolution. Around 4,000 plants and more than 10 tonnes of topsoil were used to create the evolving plantscape from hundreds of mosses and ferns to the evergreen Araucaria araucana (monkey puzzle tree), Taxodium distichum, and Ginkgo biloba (maidenhair tree). Flowering plants included orchids and anthuriums. As the variety of plants evolved over time and increased throughout the biome, so did their form, texture and colour. The journey started with a limited green-scape of tiny, delicate ferns and mosses. Then ferns with broad and robust foliage partnered upright Papyrus and Equisetum along with trees such as Metasequoia glyptostroboides. As the journey brought the visitor to present day, pale-coloured orchids and creamy Liriodendron tulipifera (tulip tree) gave way to a floral rainbow to represent man's cultivation of garden plants. Calycanthus (sweetshrub) and Magnolia grandiflora are the earliest known flowering plants, which first appeared in the Cretaceous period, 145-66 million years ago. As well as seeing our inspirational gardens and features, visitors to the show indulged in a spot of plant shopping in our fabulous Floral Marquee and Plant Village. Paying tribute to the 24 men of the Royal Parks and Palace gardens who lost their lives in the First World War, the Battlefields to Butterflies feature vividly portrayed the trenches of the battlefield. A meadow of flowers stood alongside to represent how the same landscape was reclaimed by Mother Nature after the conflict ended. If you haven't the space to plant outwards, plant upwards. Living walls were a feature at the show, with visitors treated to inspiration for greening upright spaces. Growing plants on walls can soften the overall appearance of hard structures and can be perfect for growing vegetables or flowers, while also hiding a multitude of concrete sins. Designed by sculptor and artist Martin Smith, the Kinetic Arboretum comprised of three kinetic trees providing a narrative about growth and celebrating engineering in a beautiful, poetic way. At the tip of each metal branch, delicate kinetic elements responded to the wind and caught the sunlight to create rhythmic movement. In the Floral Design Studio, the highly accomplished skills of many floral designers and floristry colleges were on full display with a wide range of materials used to interpret the themes of Floral Webs and Evolution. Somerset Postal Flowers won Best Exhibit in Floral Design Studio for their evolution display 'Which came first, the chicken or the egg?'. Also on show were the inspired designs of the student finalists in the RHS Future Florists competition. There was plenty of family fun to be had at the show, including a soft play area and crèche for tiny tots, with face painting and balloon-making. The Campaign for School Gardening area was full of activities to encourage those of all ages to have a go at gardening. There was also the opportunity for visitors to find out more about the benefits of growing for food, wildlife, wellbeing, and the good of the planet. The colourful and creative Scarecrow Competition featured entries that were designed and built by local schools. The theme this year was 'You are what you eat', celebrating the amazing variety of fruit and veg grown around the UK. Visitors dropping by were able to find out more about the important benefits of producing your own edibles and saw the visitor-voted favourites, including first-place winner Monty by Montbelle Primary School, second-place winner Bertha Pollen Bee Feast by Goodnestone Church of England Primary School and third-place winner Healthy Hetty by Buckhurst Hill Community Primary School. More than £1,100 was raised from the vote, which will go back into the RHS Campaign for School Gardening. There was a full programme of fascinating talks and demonstrations throughout the show. At the Dig In Cookery Theatre, visitors were inspired by the likes of Masterchef's Greg Wallace, The Fabulous Baker Brothers and Deliciously Ella to create culinary delights. Over in the Festival of Roses Theatre, there was the opportunity to learn more about floral design, the best roses for small gardens and how to style your garden. For those wanting to get more hands-on, our workshops gave guests the chance to learn a new skill, including calligraphy and floral design. The Village Green Bandstand and the brand new Palace Stage featured a whole array of bands, from country music festival favourites, Flats and Sharps (pictured), to art school legends, Deaf School. It was the perfect place to spend time relaxing before being re-immersed in the show. Bands and singers played throughout the day at both stages and in the Kings Food Court. Catch up with all of the latest news and information from the RHS Hampton Court Palace Flower Show 2018. Whether you're a secret shed gardener with a power tool habit or an eco-warrior with a mission to repopulate the world with wildflowers, explore more opportunites to get your gardening fix.